Subscriber Dirties Her Hands With Dough! June 12, 2013 June 20, 2013 by midgeguerrera, posted in Food - Eating In and Out! This post was sent to me by an incredible cook, Kathy Hall. I know she’s a great cook because I have sat at her table and practically licked the plate clean every time she invites me over. She has been following “Nonna’s Mulberry Tree” and sent me this pictorial post of her own. Enjoy! 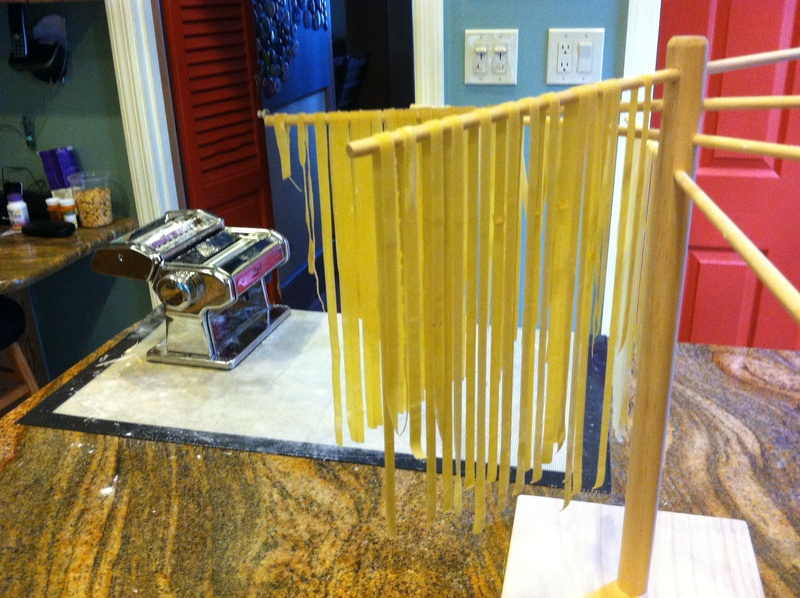 Homemade fresh pasta has always ranked high on my kitchen bucket list. I have always cooked almost everything from scratch and still have a fond memory of a pasta party at my friend Grace’s college apartment. She was the first in our crowd to get a Cuisinart and we watched in amazement as in less than two minutes the flour and eggs formed a ball of dough right in the bowl. We liked it so much we did it three times. Luckily, being Italian, she had a pasta maker so we all took turns cranking away for about an hour then happily stringing fresh strands on the back of every available kitchen chair. That was over 40 years ago. This summer my friend Midge traveled to Italy to reconnect with her Italian heritage and I am following along virtually via this blog. One of her first posts was a recipe for homemade pumpkin ravioli with walnuts, parmesan and speck. It looked and sounded heavenly so I dug out my rolling pin and borrowed my neighbor’s ravioli cutter. It was not a complete success. The filling was a savory rustic delight. The pasta, which I insisted on rolling by hand, was way too thick and cooked up into a gummy mess of semi raw dough not worthy of it’s yummy filling. Mound of flour and one egg – here’s looking at yah! The recipe is simple, one egg, about 2/3’s of a cup of all purpose flour, a small splash of olive oil and a little salt (if I remember to add it). 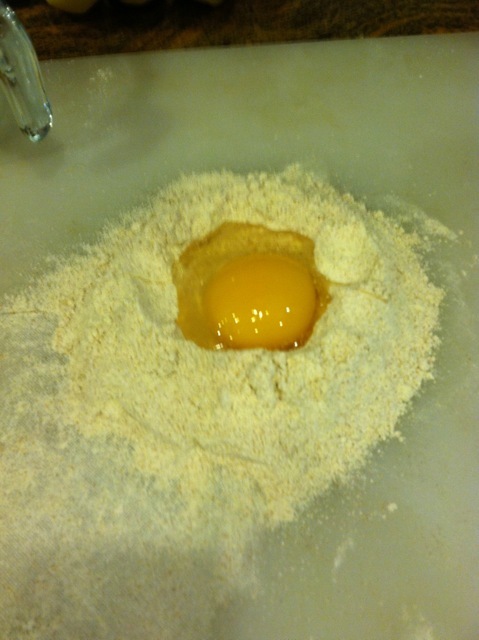 I mix it old school starting by making a hole in a mound of flour big enough to hold one broken egg. I scramble the egg, olive oil and salt with a fork and then slowly incorporate the flour working from the inside of the volcano out. Make sure you washed your hands! When the fork gets coated with the thick egg flour mixture I switch to my hands continuing to incorporate flour until I have a not too wet, not too dry dough. It’s not as magical as the Cuisinart but it’s a lot less clean up. The next step is where practice makes a difference as I transform that sloppy doughy mess by manipulating it with my hands. 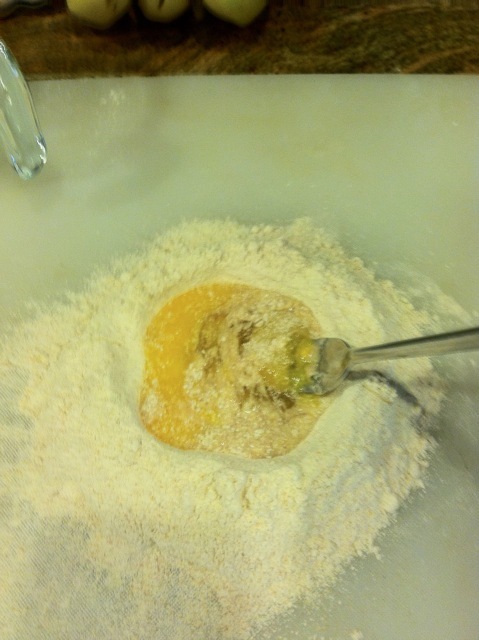 Pasta making is similar to bread making. You have to experience how the dough should feel as you knead it. Ideally your Italian grandmother shows you this. I’m Irish so I learned by experimenting and seeing how different doughs perform as pasta. For those non bakers, here’s how to knead. Flour your hands and the board. Stretch the ball of dough you formed by pushing down and away from you with the heel of your hand, then rotate 90 degrees, fold in half and push again. If it’s too wet sprinkle a little more flour on the ball and keep working it. 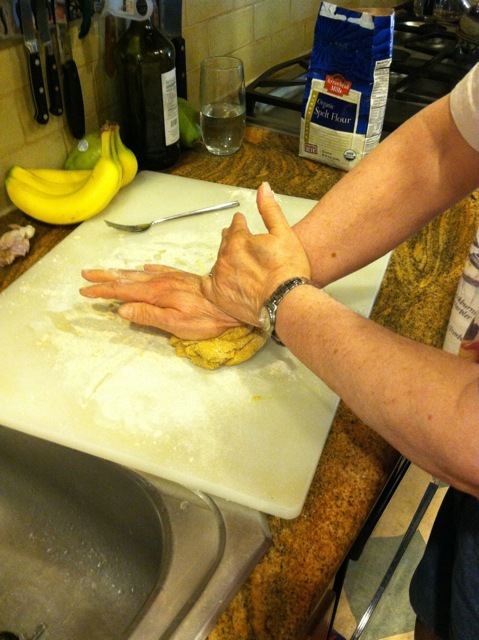 If it’s too dry wet your hands and incorporate that little bit of water as you knead. A lot depends on the size of the egg, how much olive oil you put in and the humidity in the air. Relax, work slowly and enjoy. In time you will know when you have the right combination of flour, eggs and water. Eventually the dough will stop sticking to your hands and start to become silky. Keep pushing away, folding and rotating until the dough is smooth and springs back when poked. It takes between six and ten minutes total and is a nice upper body workout. Then form the dough back into a ball, wrap it in plastic wrap and let it rest at room temperature for 30 minutes. 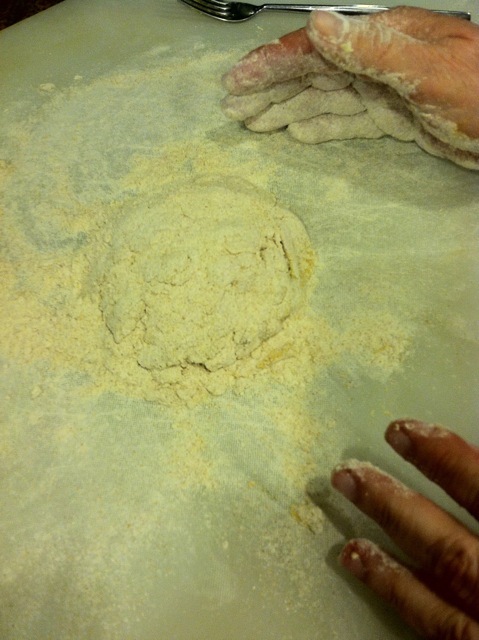 Some recipes say to flour the ball before wrapping it, others say to coat it with a little olive oil. I flour if the dough seems a little wet, oil if it seems a little dry. While the dough rests, I make a sauce and put on a big pot of salted water to boil. One night my sauce was fava beans, garlic and olive oil. The next it was tomato sauce with turkey sausage and mushrooms that I had in the freezer. The classic combination of butter and cheese is also good. After the dough rests, and the sauce and boiling water are ready. Either try to roll the pasta out by hand or dig out a pasta machine and follow the instructions. I strongly recommend the pasta machine. Unlike the Cuisinart, it never has to be washed, just dusted off with a pastry brush. Roll your pasta dough til it’s thin enough to see your hand on the other side, cut into your favorite shape, cook for two to four minutes depending on thickness, toss with sauce and enjoy. . I can’t speak about left overs since we have had none. 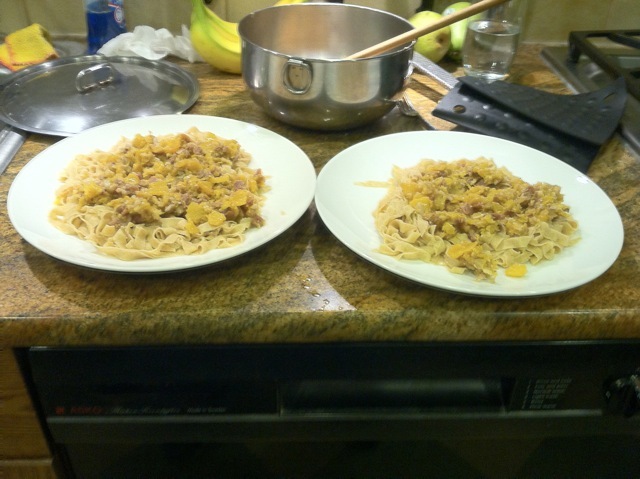 This recipe serves two people if you are used to 2 ounce dry pasta servings. Next week I’m tackling those ravioli again. Great use of my iphone photos. After I master pasta I gotta master blogging. Making Pasta seems easier than my new computer and my lack of adequate computer skills.